Robert Shiller’s S&P 500 Forecast for 2020: Is He Overly Optimistic? Real earnings in 2020 are 78.20 per share. He is assuming real earnings growth of 1.5% per year which is the long-term average. CAPE (cyclically adjusted price earnings) or PE10 ratio of 15. This is the 1890-1990 average P/E. He excludes the “bubble” years of 1990-2010 which would inflate the average P/E to 16. Result is a 1430 level on the S&P. This is hardly an overwhelmingly optimistic forecast but Shiller – who does these long-term forecasts better than most – might even be a little sanguine when it comes to his earnings forecast. That is because he seems to be applying the historical 1.5% real growth rate to earning that are currently inflated due to elevated profit margins. If we normalized profit margins to their post-2000 average of 6.8% (TTM average S&P 500 margins are 7.2%) and then apply 1.5% growth we come up with 2020 real earnings of 73.8. Adding 2% inflation and using the 15 multiple we would get a S&P 500 value in 2020 of not 1430 but 1370. This works out to a 9% increase over 10 years or 0.9% annually. Using the corporate profit to GDP analysis I have done in the past allows us to calculate 2020 earnings via another method. 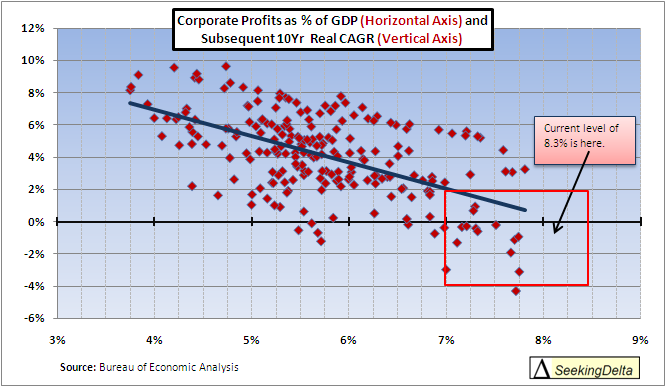 When corporate profits are above 7% of GDP (the current level is 8.3%) the average 10 year real growth in profits is only 1.1% annually. This below average growth is due to profit margins being one of the most mean reverting metrics in finance. Using the 1.1% growth rate from current levels we get real 2020 earnings of 75.4. Applying the same 2% inflation target 15 PE multiple we get an S&P 500 value of 1392. An 11% total 10 year increase or 1.0% annually. The bottom line is that while Shiller’s 2020 earnings forecast may be a bit optimistic using 2 different methods lends similar, while slightly lower results. The real key to forecasting the 2020 S&P level is nailing the P/E multiple which is much harder than forecasting earnings. I am perfectly happy using Shiller’s suggested P/E of 15 as the P/E is typically driven by interest rates and inflation both of which are low and stable. Interest rates are still near historical lows and inflation has been relatively stable for some time. An increase in rates and a decrease in inflation stability, both of which seem highly likely, should drive the P/E multiple closer to 15 than its current level of 23.4 – a level higher than all but 13% of monthly occurrences since 1900. A good, active investing strategy is likely to outperform in this environment. With the S&P 500 essentially stuck in a trading range for the next decade buy and hold will disappoint. If you have the time and ability, use the strategy that best works for you. Diversify among asset classes. Commodities may outperform one year, emerging markets the next and debt the following. Don’t limit your investments in this environment to an equity index. Rebalance. According to Ed Easterling at Crestmont Research (pdf) the impact of rebalancing (selling a portion of your winning asset classes and buying the under performing ones which later become over performing assets) annually versus bi-annually (every other year) is a 1.3% benefit annually during bear markets and a 0.3% loss during bull markets. Please see the entire interview with Robert Shiller below.